I’d been planning on including my new Show Beauty Dry Shampoo in a collective post about my favourite dry shampoos but the thing was, the more I used it, the more I realised that I hadn’t used any of the other ones for weeks. I have actually given all but my Klorane dry shampoo away now and this is what I use on the daily. So instead of my best dry shampoo blog post, I bring to you a post about my new fave Show Beauty hair care products as I have had to switch up what I am using a bit as I can’t use absolutely everything I have with my new tape in hair extensions. For example, I can’t use any of the shampoos. My new favourites obviously start with the Dry Shampoo and then there’s the Working Texture Spray and the Volume mist. I’ll give each of them a mini review and hopefully, you’ll find out about 1 or 2 new products that you might like to try. I will say, this is a luxe hair care brand, it’s expensive (well I think so) but it’s the only luxe hair care range where I think the price is justified. Outrageously indulgent? Yes, but it’s damn good. The dry shampoo is one of the cheaper products in the Show Beauty range but it does cost £30 from Lookfantastic. For me, dry shampoo is a bathroom staple as I only wash my hair once a week. The can is huge and the lid, so gorgeous. I admit, I quite like feeling fancy. So why is this better than your bog standard Batiste, which honestly is a fine product. The difference is, this is not just ‘fine’. This smells like a Chanel perfume, it gives you crazy volume, absorbs grease or sweat after the gym and is so easy to use. The texture is soft and silky and not like the gritty dust texture that you get with cheaper products and the whiteness brushes out easily to leave you with blow-dry standard hair. I adore this. An innovative volumising hair spray, you spray just a little onto the roots of your damp hair to give you a natural brushable finish. 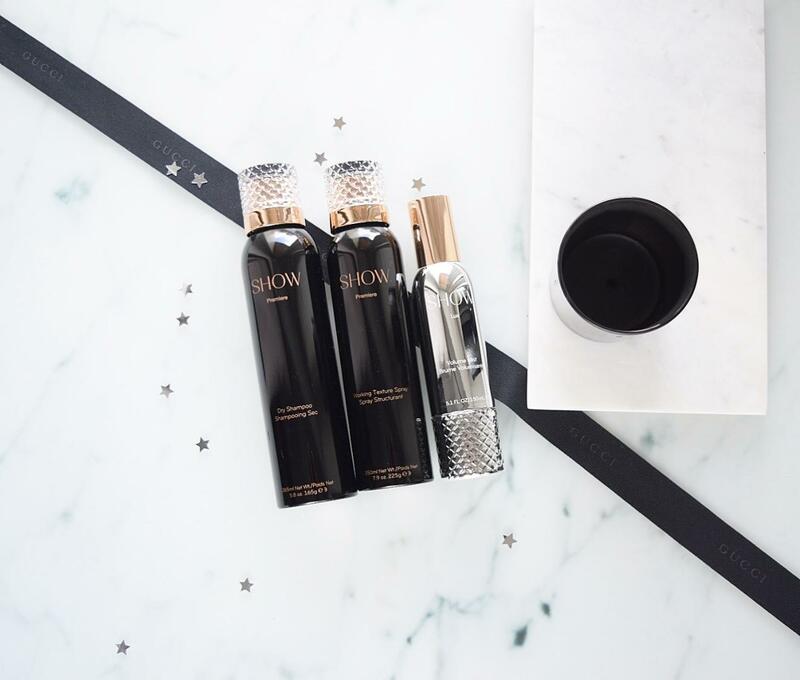 It’s exactly what you need if you’re trying to get the bouncy blow dry look at home. This product is heat activated so you will need to blow dry your hair to get it to work properly and if you don’t already, use a round brush for the best effect. It is also fantastic if you’re curling or waving your hair. £35.00 from Lookfantastic. Have you ever tried Show Beauty?